Lex The Hex Master is set to be interviewed and perform on The Ryan Show. 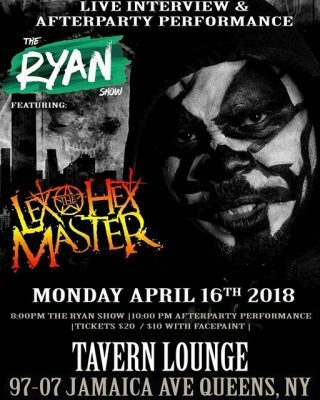 The interview and performance is set to happen on Monday, April 16th in Queens, NY at Tavern Lounge. Tickets are $20. You can purchase tickets for $10, if you are wearing face paint.